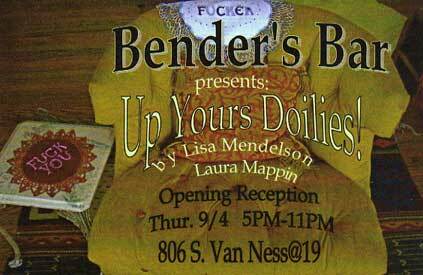 Opening Thursday Sept. 4, 2008 from 5-11pm, Lisa Mendelson and I will be showing more doily bits at Benders Bar, 806 S. Van Ness @ 19th in San Francisco. Here, I'll have new silk designs on display. 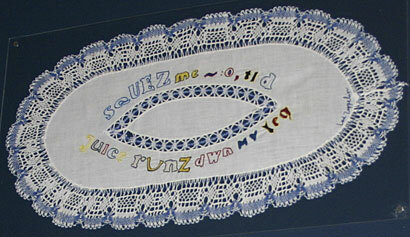 Lisa hand embroiders text message versions of her favorite lyrics onto linen and cotton doilies. 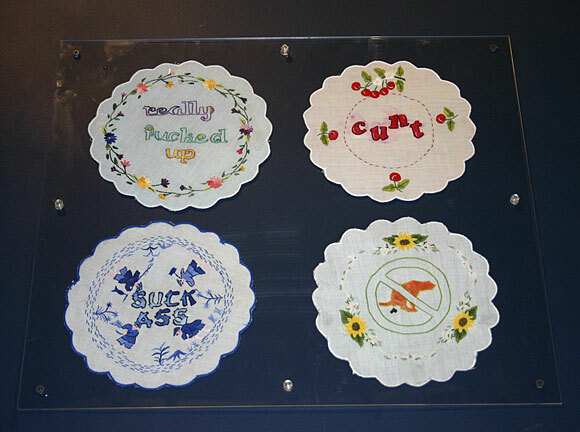 She's as prolific with these as I've been with "bad" doilies, maybe even moreso. Come to either opening and meet her - she's a kick! And I'll be at both openings too and you might know how much of a kick I am. And if YOU show up, we'll all be so kicky!! If you come to the SOAP opening Saturday, both shows will be up and you can see the bar show on your way to or from the SOAP show! 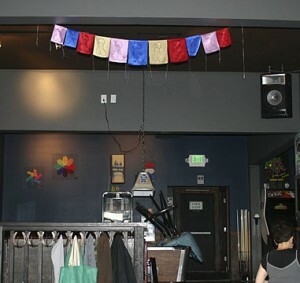 This page is an archive of recent entries in the Benders Bar category. Climate Theater is the next category.